Sunday School / Bible Class 8:30 a.m. Sunday Divine Service 9:30 a.m. 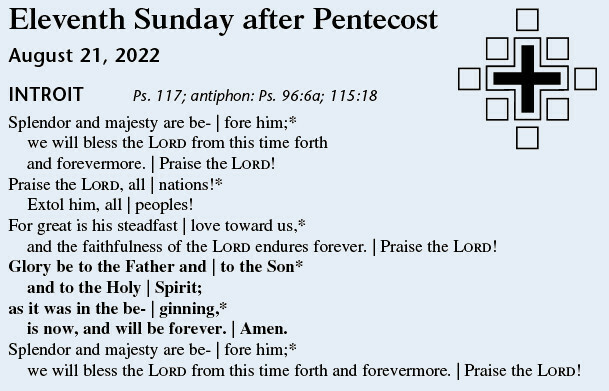 Appointed Readings for April 14, 2019 "Palm Sunday / Sunday of the Passion"
The Introit, Collect, and Gradual are from Lutheran Service Book: Altar Book, copyright © 2006 CPH. All Scripture quotations, including those from Lutheran Service Book, are from the ESV Bible® (The Holy Bible, English Standard Version®), copyright © 2001 by Crossway Bibles, a publishing ministry of Good News Publishers. Used by permission. All rights reserved.